“Faster,” “leaner,” “stronger,” “slimmer.” These are just some of the claims made by dietary supplements marketed to athletes. And, for athletes looking for that elusive competitive edge, these claims can be enticing. But, buyer beware. Most potential performance enhancing dietary supplements on the store shelves have not been rigorously tested for effectiveness or safety. Thus, athletes would be wise to exercise caution before purchasing a potential performance enhancing dietary supplement. This month’s nutrition column aims to assist the athlete in evaluating dietary supplements and determine which, if any, of the currently popular dietary supplements marketed to endurance athletes are worth the money. Dietary supplements are under the jurisdiction of the Food and Drug Administration (FDA); but, are regulated much differently than either foods or drugs. In fact, “regulation” may be too strong a term for the current governmental oversight of dietary supplements. This is largely due to the Dietary Supplement Health Education Act or DSHEA- a controversial piece of legislation that was introduced and ardently supported by Utah Senator Orrin Hatch back in the early 1990s. Under the protective umbrella of DSHEA, dietary supplement manufacturers are not required to prove that a supplement is effective before marketing it to the consumer. They also do not have to follow any particular manufacturing standards and they have an excessive amount of leeway with respect to the health claims they can put on a label, so long as they do not claim to actually treat a disease. Supplement manufacturers do have to file safety information with the FDA and must wait 75 days after filing to market the product. However, listing the information does not mean the FDA regards the product as necessarily safe. In practice, the FDA lacks the funds and the manpower needed to effectively police dietary supplements and/or remove them from the market, even if research suggests that they are “hazardous” to health. A good example of this is the case of ephedra (a stimulant that has been shown to cause severe negative health effects). Despite extensive research and numerous reports documenting the negative side effects of ephedra (and its alkaloids), the FDA was initially unable to remove the substance from the market, largely due to significant opposition from the supplement industry and the U.S. Congress. While it is currently banned, it is still fairly readily available for purchase on the internet and can be found in some products sold locally. Given the insufficient regulation of dietary supplements by the government, it is really up to the athletes themselves to evaluate the safety and efficacy of supplements they are considering taking. The following questions can help guide that evaluation..
• Is the product marketed primarily by testimonials? This is a common marketing technique by supplement manufactures and should be regarded as highly suspect, especially when popular and/or famous athletes provide the testimonials. It is quite likely that the athlete pushing the product is being paid a pretty penny for his/her endorsement and has never even used the product or, at the very least is exaggerating the supposed results of the product. • Are the claims provided by the supplement manufacturer backed by scientific research published in reputable, peer-reviewed journals? If not, it is very possible there is something about the research that the manufacturer doesn’t want the general public to know. Unpublished research claims are often based on research that has never been performed or on flawed research studies that are not supported by fellow scientists (i.e., peer-review). It should be noted that supplement manufacturers also often take published research out of context. So, even if there is research supporting a supposed benefit of the supplement, the athlete should carefully scrutinize the study for valid methodology and accurate interpretation of the results. • Does the product use buzzwords and psuedo-medical jargon in their advertisements? Words such as “pumped”, “boost”, “ripped”, “balance”, “energize”, “detoxify”, etc. are popular among supplement manufactures because they sound good and can’t be objectively proven or disproved. (Indeed, how does someone measure balance? Would you know if you were detoxified?) Likewise if a product has a “secret formula” that is not known to the general scientific community be very skeptical! • Does the product offer a quick fix or make claims that are just too good to be true? Remember, if it sounds too good to be true, it is! Improvements in athletic performance, changes in body weight and/or body composition, even recovery from intense training sessions take time and effort (and a well-balanced diet). No dietary supplement on the market today has been shown to make these processes easier or faster; thus, any supplement that claims to do so should be viewed with doubt. There is no doubt that athletes have unique nutritional requirements and need more of certain nutrients than their sedentary counterparts. However, these additional nutritional needs can generally met by a nutritious diet comprised of FOOD. With very few exceptions, most dietary supplements currently marketed to athletes are infective and some are downright dangerous. Instead of spending money on supplements to enhance athletic performance, the athlete would be better advised to contact a local sport dietitian for a dietary assessment and personalized food plan (see contact info below). An exhaustive list of all the currently available dietary supplements marketed to athletes is beyond the scope of this article. 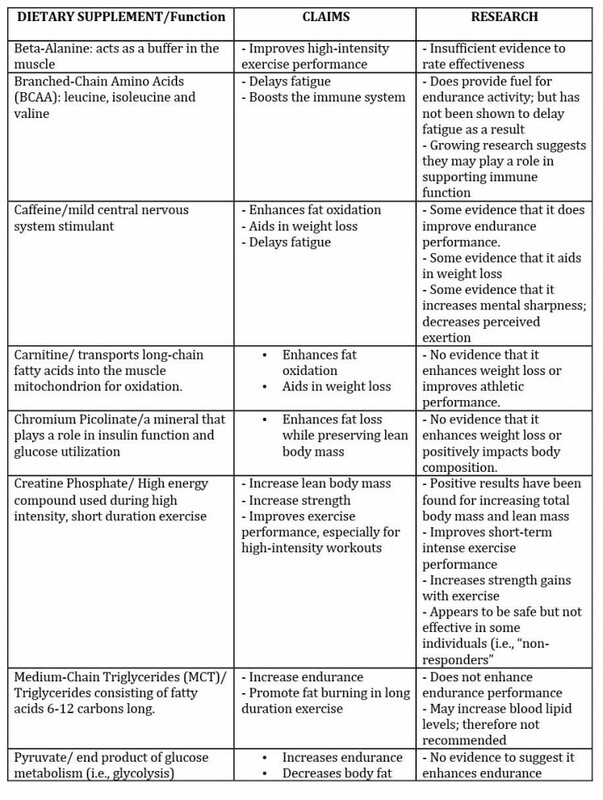 However, below is a list of some of the most popular supplements used by cyclists, along with their claims, and the existing research supporting or refuting the claims. – Delays fatigue – Some evidence that it does improve endurance performance. – Aids in weight loss – No evidence that it enhances weight loss or improves athletic performance. – No evidence that it enhances weight loss or positively impacts body composition. Katherine Beals, PhD, RD, FACSM, CSSD is an associate professor (clinical) in the Division of Nutrition at the University of Utah. She is a registered dietitian, a Certified Specialist in Sports Dietetics and a fellow of the American College of Sports Medicine.